* Your favorite outdoorsman will love this handy personalized wood-handled knife, ideal for fishing or hunting trips with his friends. 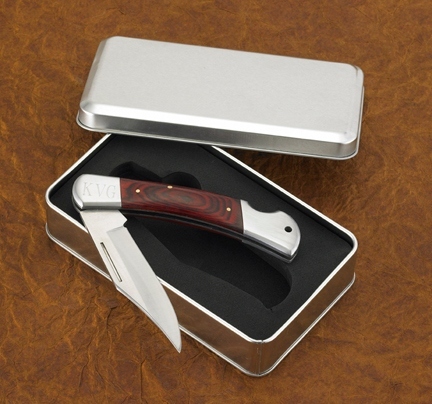 * Handsomely appointed with silver accents, this foldable knife comes in its own attractive silver box for easy carrying and storing. * Hinged end of knife can be personalized with the recipient's initials. * Knife measures 5" x 1 1/2" x 3/4" closed and 9" fully extended. * Box measures 6 1/4" x 3 1/2" x 1 1/4". 5" x 1.5" x 0.75"